Bartley Booz and Julia Greer in For Annie. Photo by Gracie Gardner. BOTTOM LINE: A fascinating piece of meta-theatre that explores some of life’s most baffling existential questions. For Annie is an interesting exercise in commemorating a human being. The play is a staged memorial for Annie Lambert, a college student who was murdered by her unstable and jealous ex-boyfriend. Her sorority sisters are asked to arrange a presentation to celebrate the life of their fallen sister, so they decide to perform a play that tells the story of her life and death. Each character is a college student and plays the part of someone who was close to Annie. There is something particularly interesting and macabre about the entrance of the girl playing Annie, a freshman named Leah (Julia Greer). We're told that she didn’t really know Annie, which rings true as she doesn’t assume the same amount of grief as the other sisters; perhaps this is why she was assigned the largest role. The meta-theatre elements of For Annie are quite sophisticated. The actors are not just playing college students—they are playing college students who are acting in a play. 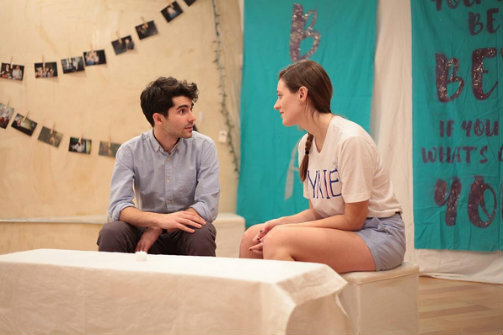 And so they go about capturing the youthful angst that college students—as opposed to seasoned actors—might feel when performing for an audience of their peers. The ensemble of sorority sisters welcomes us at the very beginning with a youthful, nervous energy mixed with profound grief. I was convinced that the actors were really college students who had come to New York to memorialize their friend, and I found myself growing irritated with the silly, self-absorbed anxiety of their naiveté. Ultimately, I realized that these ladies were not college students at all, but actors who perfectly captured the mindset of innocent youth. The performances are so natural and convincing that it’s easy to be persuaded that this is a devised piece based on personal experience and improvisation. But the play, by Beth Hyland, is masterfully scripted from the first curtain speech to the final number, thought to be Annie’s favorite song. Director Emma Miller guides the production gently without imposing extraneous staging that might disrupt the illusion that this is an independent production helmed by college kids. It almost seems as though this production has been coached rather than directed. I was particularly taken with the performance of Bartley Booz who plays Raf, the student charged with playing Annie’s killer, Nick. Booz enters first as Raf to assure us that he is a really nice guy and explains that this is not a role that he is particularly comfortable playing. With that preface, he dives into playing the lethally troubled Nick without reservation. But at the end of the show, he appears once again as the well-intentioned Raf, providing the guitar accompaniment for the final song. I attended For Annie fully expecting a lesson on possessive boyfriends and relationship violence. But the show asks much more interesting questions. What does it mean to memorialize someone? Do we imagine we’re serving the deceased or does it simply give the living a chance to make peace with the great unknown? Perhaps it’s a futile attempt to infuse meaning into the ridiculousness of death. Do we have a responsibility to remember and celebrate the deceased in a manner in which they would have approved? When we die, our essence is simplified; we become a symbol. Annie’s life becomes a cautionary tale of domestic abuse. But would she have approved of being immortalized in that way? My guess is whoever this character is based on led a much more nuanced and interesting life. These are the fascinating, if somewhat macabre, questions that Hyland's sophisticated play is asking, questions that we would never think to ask when faced with loss in real life. It turns out attending a memorial service for a fictional character is useful. For Annie is by Beth Hyland. Directed by Emma Miller. Choreography is by Lucia Knell. Set Design is Emmie Finckel. Costume Design is by Dara Affholter. Lighting Design is by Amy Elliott. Sound Design is by Lauren Zoppo. Stage Manager is Rachel Shaw. The cast is Sammi Katz, Shelby Green, Alex Najaran, Julia Greer, Laura Winters, Leila Teitelman, Andrea Negrete, Aliza Sotsky, Bartley Booz, Ari Shapiro, and Liz Colwell.